The term "bottle shock" refers to what happens to wine when bottles are shaken during travel. In this film it refers to the shock and disbelief of the French wine judges on choosing California wines over their own in a blind tasting--the famous 1976 "Judgment of Paris." The movie is the true story of the Barrett family, owners of Chateau Montelena in the Napa Valley at a time in history when only the locals knew how good American wines could be. Jim Barrett (BILL PULLMAN) is a struggling winery owner also dealing with a useless hippie son Bo (CHRIS PINE): "Wasn't Woodstock seven years ago? You either go back to school or get a job or get out!" The bank is threatening foreclosure if Jim doesn't start producing wine good enough to sell and pay back his three loans. For a film that was anything but a blockbuster the screenplay, the dialogue, and the acting are top-notch. Both great dramatic actors, Pullman is best remembered as the President in INDEPENDENCE DAY while Rickman is best known as the villain in the original DIE HARD movie. But if you like him in this film you may want to check out Galaxy Quest. Dennis Farina as always lends a comedic element. As in many of the films I've reviewed here the scenery is breathtaking. It really was filmed in the Napa valley, not on movie studio lots, and the shots of the vineyards are magnificent. There are two sub-plots: (1)a Mexican "cellar rat" (as they call winery workers) named Gustavo Brambilia is secretly making his own wine on the side. There has been controversy over how much of the movie was true and how much was fictional added for entertainment. There really was a Gustavio at Chateau M who now runs a successful winery called Gustavio Thrace. Most of the fun scenes in the film revolve around the friendship between Bo and Gustavio. (2)The female intern whose affections Gustavio and Bo vie for: no such person. What was glaringly left out of the movie was Mike Grgich. The movie makes it look like Jim was not only the owner but the wine maker. Mike Grgich was Chateau M's winemaker at the time and went on to open his own successful winery, Grgich Hills. But I read that he would not or could not for some legal reasons have his name in the movie. I of course never tasted the 1973 Chateau Montelena chardonnay but I did try the 2010 and it really was the best chardonnay I ever drank--"sunlight held together by water" was how GALILEO described wine. Napa's STAG LEAP CELLARS cabernet sauvignon won the red wine competition at the Judgment of Paris. 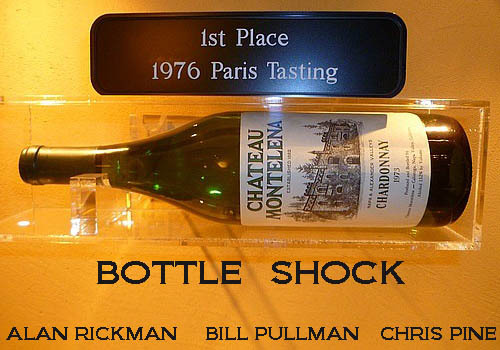 A bottle of that and the Chateau Montelena 1973 chardonnay are both on display in the Smithsonian institution. (That's a picture of the chard above.) In 2006 Spurrier organized a rematch and the American wines again beat the French! So VIVE LA NAPA!! If there is ever a round three I'm hoping Spurrier tries some New York Finger Lakes region wines, which now rival those from Napa.